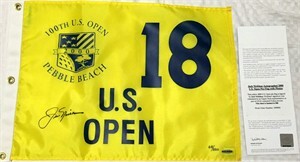 Yellow screenprinted 2000 U.S. Open golf pin flag autographed in black marker by the legendary Jack Nicklaus, who played his last U.S. Open here at Pebble Beach. Numbered out of only 500 produced. Authenticated by UDA's patented five-step process including matching numbered holograms on the flag and certificate of authenticity. ONLY ONE AVAILABLE FOR SALE.